According to statistics, today more than 70% of people, who plan their trip, look online for the necessary information regarding the travel details, tickets, and accommodation booking. If your business has something to do with the travel industry, just think of how convenient your online presence is for the customer.In fact, if you still can’t boast of a high-quality company website featuring a details service description, an intuitive interface, and a contact form, you’re already losing a LOT OF potential clients. The thing is, the competition in this industry is fierce as hell, so you better use all the possible tools to stand out. A convenient and modern website is one of them. A professional site helps simplify the interaction between the service provider and the customer. And although some people may still believe building a high-functional professional site is extremely expensive, I know it’s not. The prove for my words is inexpensive templates for your kind of travel business or blog. Al you need is to customize the ready-made theme in a drag-and-drop page builder like Elementor or MotoCMS, and voila, the website is complete. No coding skills required! TripSpot is the example where high-functionality is tightly bound with its aesthetic and design featuring stunning illustrations. If you love travel topics and you’d like to create this kind of content for your business, whether it’s a travel blog or an agency, this template will be perfect in all aspects. Besides, a minimalistic clean layout allows readers to focus on the information without getting distracted by additional elements. Among the major features of TripSpot: a fully responsive design, beautiful parallax scrolling, informative blocks and elements, Jet plugins allowing you to customize and create menus without touching a single line of code, etc. In general, you’ll get an access to a plenty of useful plugins, like JetTabs or JetThemeCores, to let you add even more eye-catching elements and effects to the website. Do you have a story to share? With the Journez theme, you simply can’t go wrong! One can easily be used for either a travel agency website, a blogging platform and other services. For instance, the template is perfect for companies organizing tourist and extreme entertainment, such as rafting, kayaking, horse riding, skydiving, bungee jumping, bus and walking tours, excursions, bicycle, scooter rental, etc. To create a unique customized design, use the Elementor drag and drop page builder supplemented with a bunch of useful plugins and other add-ons to ensure the website’s high functionality. Now it’s a turn for some MotoCMS templates. 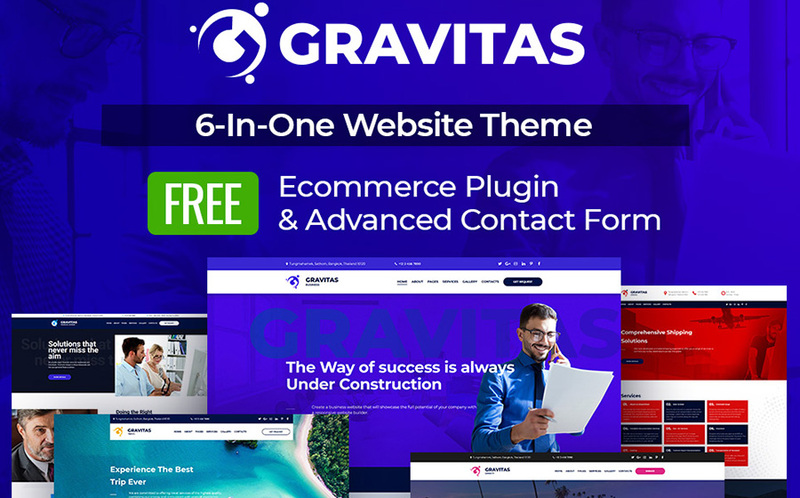 Let’s start with Gravitas – a 6-in-one website theme for any type of small business. 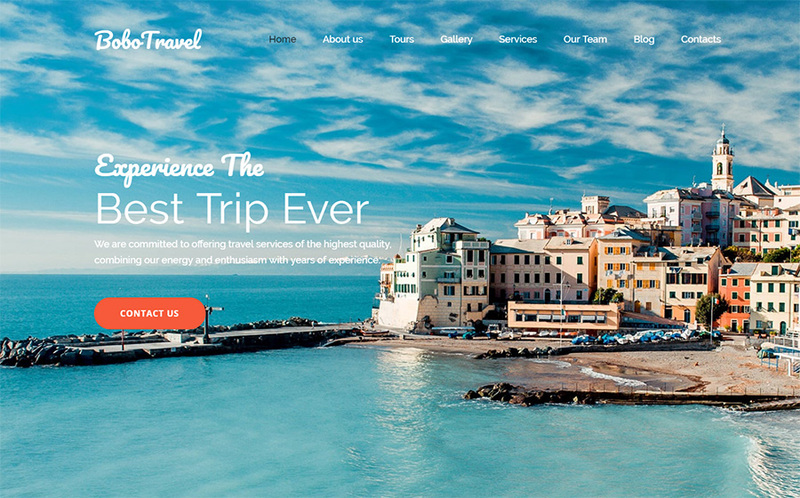 One of the homepage designs is made specifically for the websites related to the travel industry. The template is fully-responsive, well-documented and, in general, comes with a diversity of features. For example, customizable content blocks for easy editing, fully-responsive design, SEO tools, blog functionality, 2 free plugins, free support, and others. Last but not least: a convenient Moto CMS admin panel allows you to intuitively create and edit your business website as well as make quick updates. BoboTravel doesn’t seem like some kind of a super creative and unusual website entitles for various travel purposes. Nonetheless, the design turned out very stylish, with a bit of a traveling spirit. Aside from a solid business platform, one has a page for using a travel blog. In both cases, the template has everything you need. Just share your thoughts, photos or portfolio, and personalize your site in just a few clicks, without touching code. Make sure to please and impress your potential clients with a clean, modern design supplemented with wonderful illustrations from the best corners of our world. Your job has to do with leasing small yachts? Then, make sure your website ensure the user’s positive experience in all senses. After all, you are responsible not only for the tour moments but for one’s positive emotions and memories. 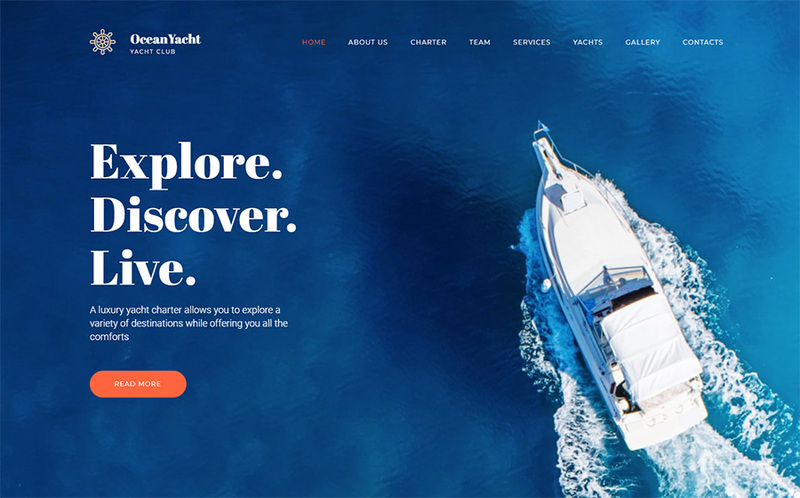 OceanYacht theme was developed exactly for this kind of purposes. A memorable design supplemented with stunning illustrations of the deep blue ocean will urge any potential client to hit make the right decision in favor of one of your offered yacht trips. Isn’t that what your business website should stimulate to? 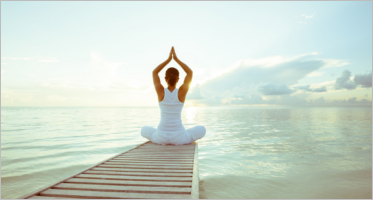 Finally, there is an example of a cool lifestyle blog template. From the first blick, one has nothing to do with templates intended for adventurous travel bloggers or so. But the truth is, SLife is excellent in all senses, whether you use it as a celebrities news portal or a lifestyle blogging platform. Whatever! 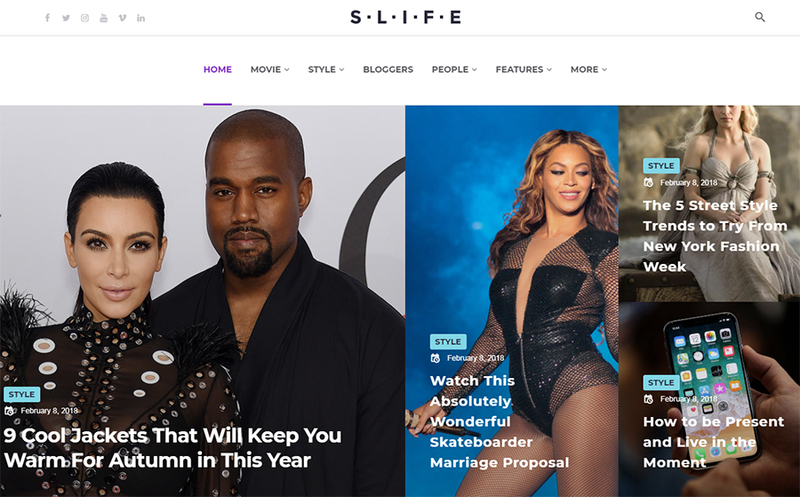 SLife is one the custom WordPress themes for bloggers because of a well-developed structure. The developers paid much attention to the SEO optimization and website loading speed – these figures are top notch here! Aside from it, there is an Elementor page builder coming with a set of Jet family plugins (JetBlogs, JetReviews, JetTircks, JetElements, JetMenu, etc.). For instance, a JetThemeCore plugin allows you to create your own headers, footers, sections, and pages to help you introduce your staff, display your satisfied customer testimonials, and much more! Running a diving club somewhere on Bali seems like a perfect occupation for so many white-collars working in a grey office of the urbanistic skyscraper. And what if some of them would like to try scuba diving during their vacation? You can make some great profits out of people’s desire to explore incredible underwater sceneries! But organizing a good diving club on any picturesque island or resort is only half of the job. The other one requires working with clients in the online mode. Since the major “communication” between you will be your own business website, make sure one is convenient and functional enough to handle a series of important operations. Thank god, with the NavyBlue theme, you do not have to rack your brains over the concept of the resource. It’s all set up for a business like that, so all you need is to fill the template with your personal content, and you are ready to go! I am so enchanted to Celerony template! 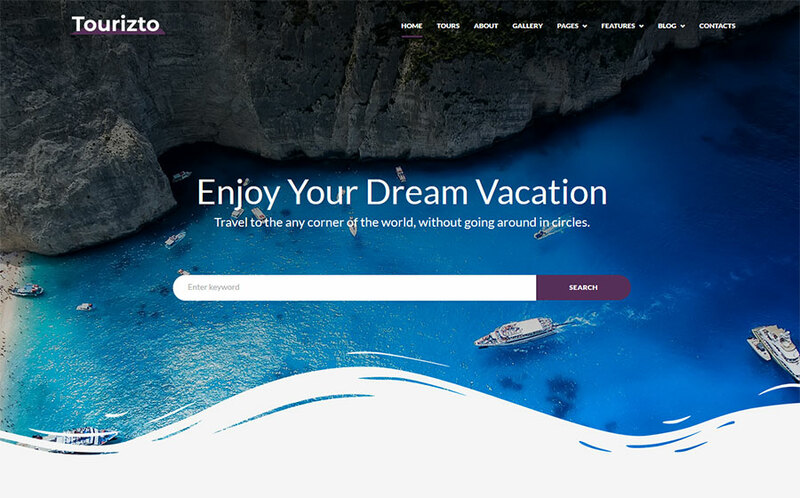 What makes the most travel WordPress themes different from Celerony is its stylish split screen with indeed laconic and exquisite design. Of course, a minimalistic interface is not something new for a blogging site but hear what comes next. First of all, the template has everything to help you launch a successful travel blog, especially if you value the extreme aesthetics in a representation of your content. No need to think of your website design and how to add standard blog elements – everything is customizable via powerful drag and drop Elementor builder. One allows you to edit your pages in a real-life mode without the need to rewrite a code. 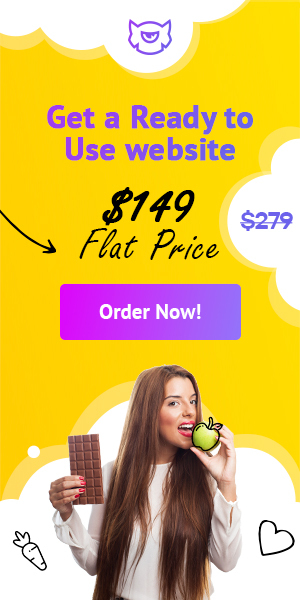 The functionality of this template is supplemented with widgets, plugins, modules and other elements to bring your website to a more professional level. 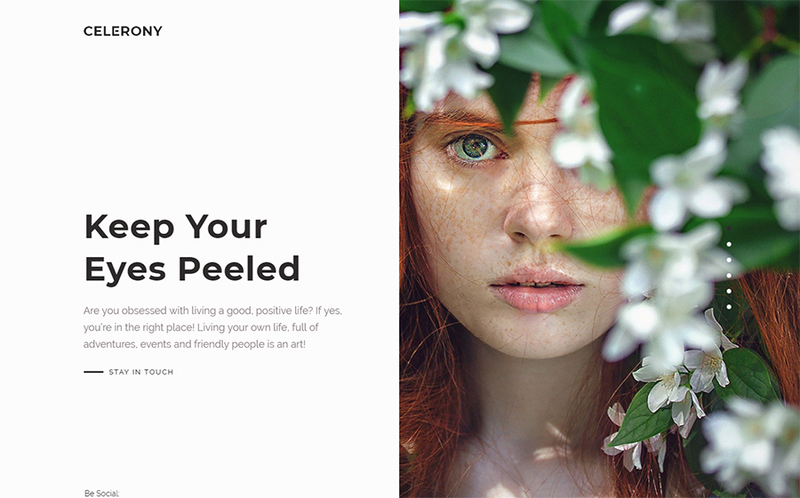 Ultimately, Celerony is one of the best blog templates for sharing your thoughts and photos about the travel in the most aesthetic way. 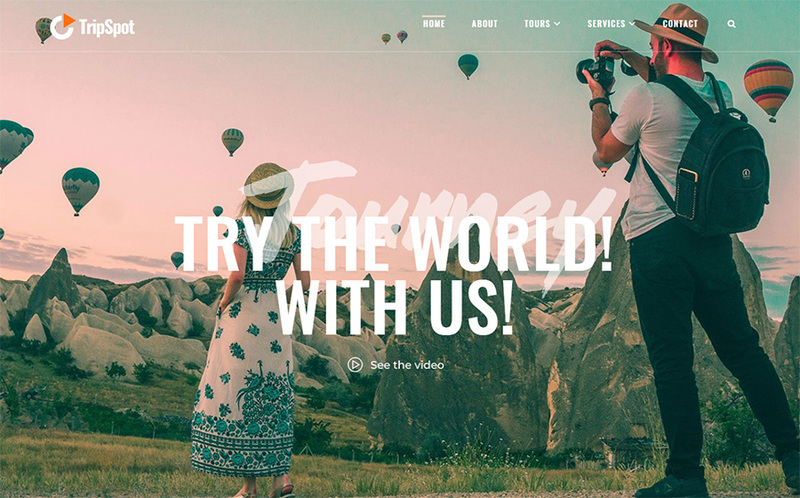 Start your own travel story with downloading this template down this link. 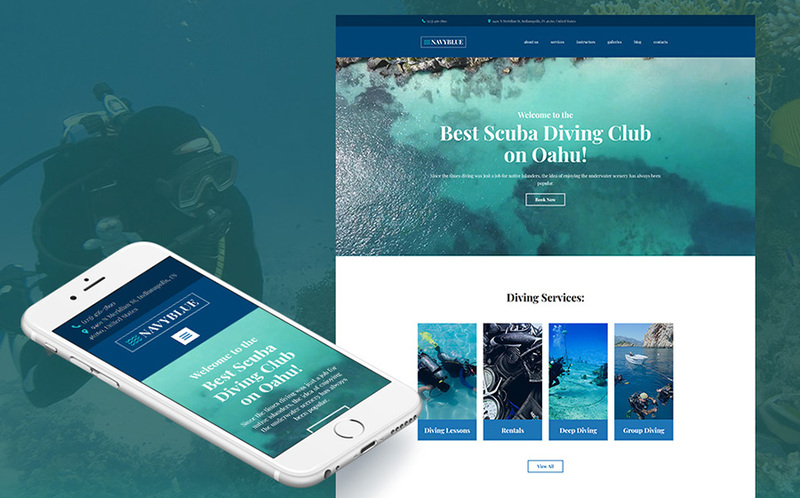 Here is another option of a fully responsive and highly-functional template of a diving club service. If your business is located on the outskirts of the world, you got to use a professional website to let people learn about your tours and make them hit the “Book” button. You will not only attract scuba diving enthusiasts from around the world to travel their wished destinations but also create an entire online community of the ocean lovers. 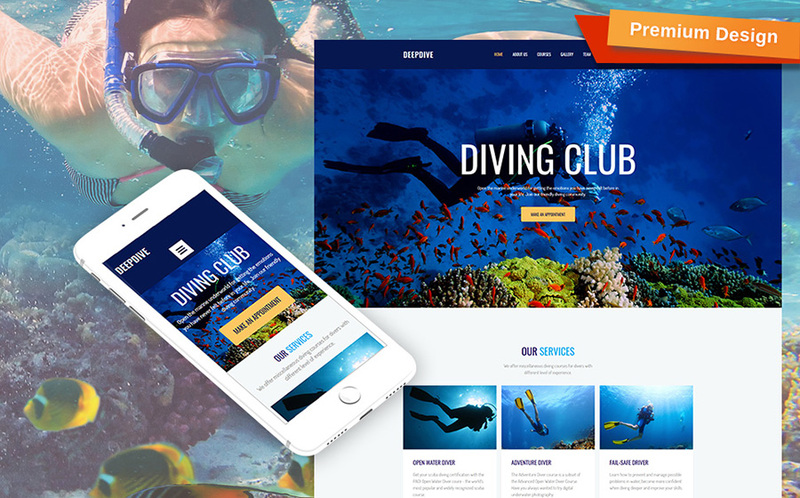 The goal of this Diving Club MotoCMS template is to provide a ready-made web solution for non-coders like you in order to complete all necessary configurations using only one accessible tool – a MotoCMS page builder. With a help of this theme, you can finally let the world learn more about your business! OnVacation offers a solid platform for all travel agents and individual tour provides. It’s a bright and positive template intended to introduce possible tour options of any kind to potential clients. If you purchase this theme, you won’t have to worry about anything. One can boast of an outstanding design that comes with a bunch of additional elements and styles to change the page. And although I already mention Elementor for the umpteenth time, we can’t deny how convenient and high-functional this drag-and-drop page builder can be. Have fun with managing the OnVacation template! And you definitely will… in a good sense, of course. 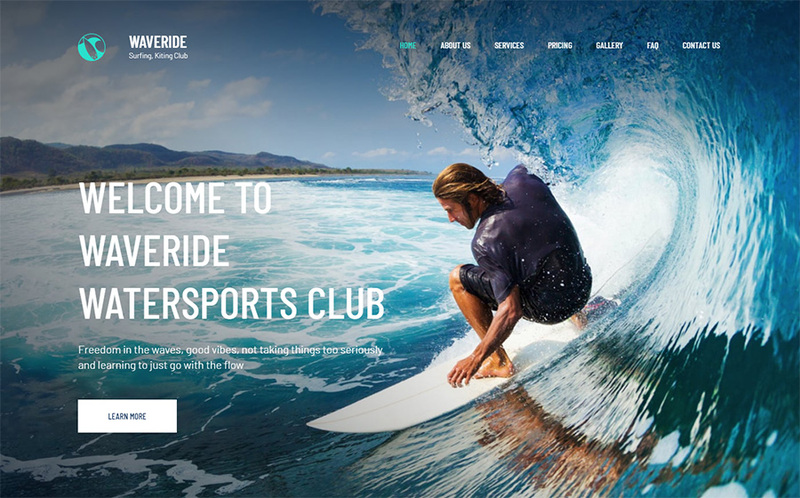 Take a look at one of the most convenient web solutions for a watersports club booking service or any other company organizing extreme sports activities. The template has everything to help you successfully run the service online, from a detailed description of each activity to galleries filled with breathtaking photos and prices for equipment. A handy set of MotoCMS features are, as always, included! 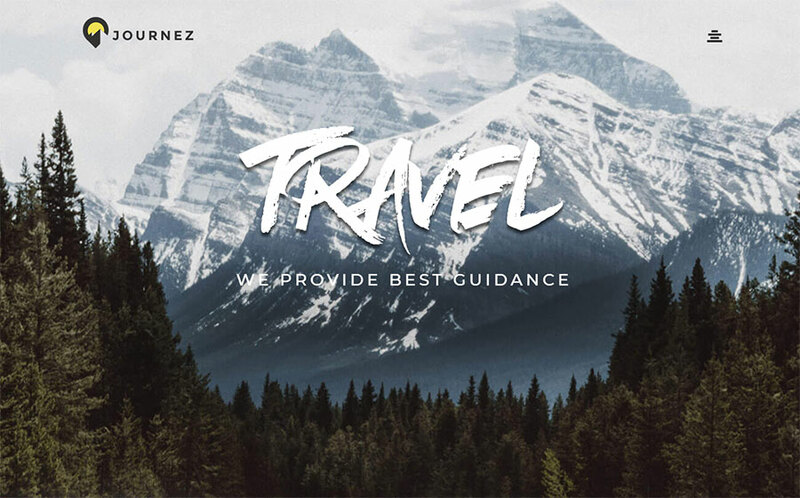 Tourizto is a universal WordPress template that works perfectly for a travel agency. The template is creative and has a simple and clean design. The main page of the following template lets you experiment with its look. For example, the demo version offers a cool search field featuring photos from the most popular destinations. In addition, the theme lets you add other services, post reviews, best offers, blog feed, etc. There is no need to mention the template is fully responsive and cross-browser compatible. Like any other Elementor-based theme, it offers a whole set of widgets, and user-friendly settings for the admin, Google fonts, SEO-friendly code, and much more! 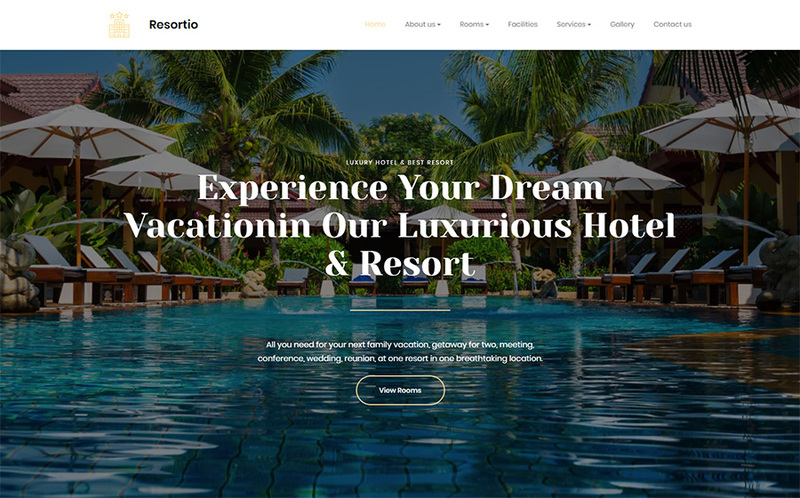 If your goal is to create a successful website for a luxury hotel and resort, take into consideration the Resortio MotoCMS template. The developers offer an easy-to-manage website with an instant subscription form, good online documentation, and 24/7 support. 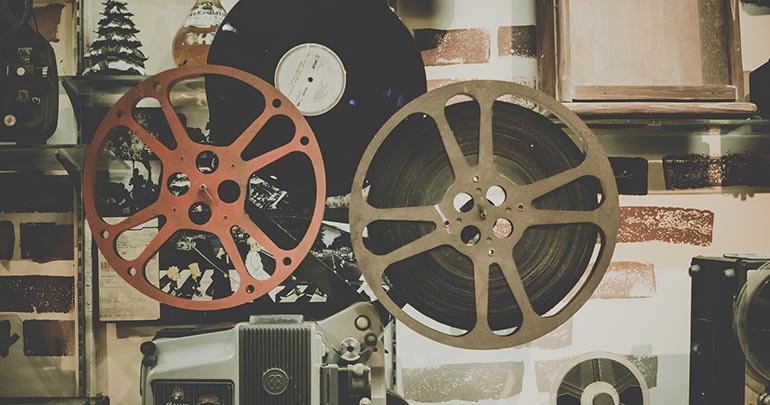 You can pick among zillion of ready-made blocks, as well as add a plenty of available free widgets, such as audio and video player, color picker, social media, photo galleries, etc. If you want to try Resortio and its features, just check the demo, and you’ll see it makes the best fit for a luxury 5-star hotel somewhere on the exotic island. Here is another rather universal option for developing a WordPress thematic site. It has a clean design that will definitely appeal to lovers of minimalism. In general, such a design contributes to reading the blog information more attentively since the content of the blog plays a major role here. WordMap is supported by Elementor builder allowing you to make changes to the layout and design of all pages. Provides a convenient search system by categories and lets you share stunning pictures from the visited places. There is an entire collection of Google fonts for those who like to experiment, as well as important for the blog social integration, plugins, ability to leave customer feedback, and other elements. The template is SEO-optimized and originally created for mobile devices to attract more visitors. 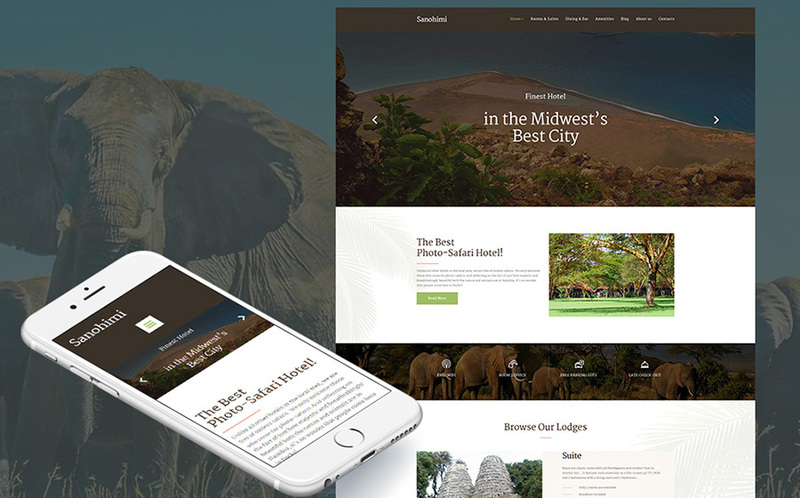 Let’s close our list with this wonderful African-style MotoCMS theme. Although by default Sanohimi is presented as a photo-Safari hotel. The template can be a great match to a website for any high-rank hotel. It features a booking form, seven ready-made page layouts as well as the ability to customize colors across the entire color palette. Hence, the theme will look amazing on any screen, especially on devices with a Retina screen. To create and customize pages, there is a MotoCMS page builder at your disposal, including the featured special widgets and social integration. Supported by major browsers and a 100% responsive design will help you achieve high SEO-indicators, which will positively affect the success of your business. No doubts, a professional travel industry website should not only look elegant and stylish but also remain informative and high-functional. The templates listed in my review have a rather a strict and minimalist design with an emphasis on informativeness, content, and service. I am sure all travelers, tourists and other lovers of outdoor activities would have the greatest experience using websites like that. Of course, these were far not all the WordPress and MotocCMS templates for a travel business and blogging that I have found online. 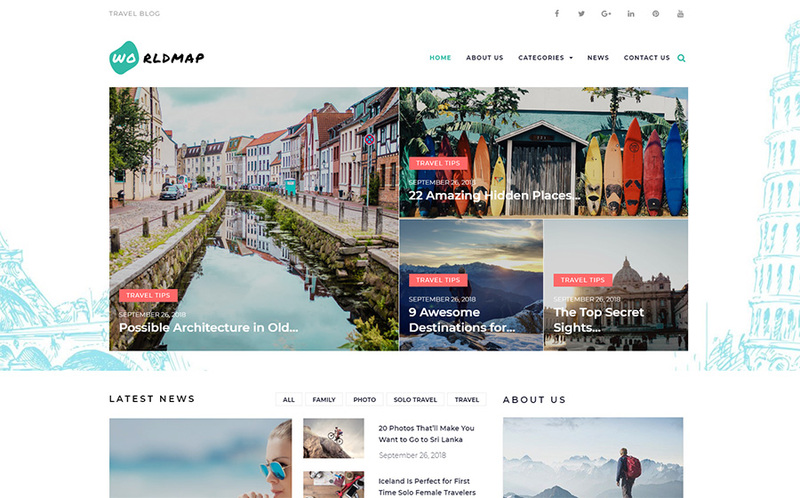 TemplateMonster offers a lot of travel site themes and you can look them all up by the link. All of them have enough functionality to develop a solid business website. Hope you will find the perfect template to make your travel business flourish and gain more customers!